A delightful dining chair with a beige linen seat and back with pin striped reverse. The carved Wooden frame and legs have a vintage patina and studded detailing. These classic upholstered dining chair adds a sense of occasion to family dining. 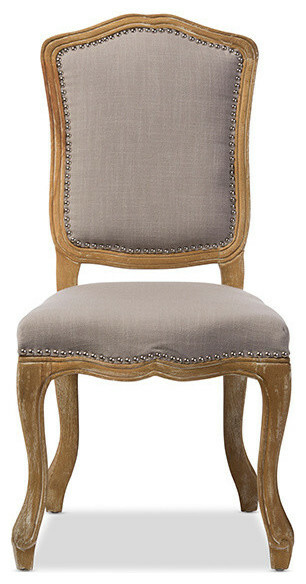 When we visualize a typically French chair, this is it! A subtle weathered oak effect finish and flared cabriole legs hint at Gallic tradition, resulting in a French farmhouse feel. This dining side chair reminds us of vintage French dressmakers mannequins, with its beautiful fabric cover, Wooden frame and beautiful form. Upholstered with a beige linen cotton material on its weathered oak frame, this chair would sit perfectly in a French chic dining room or stylishly neutral lounge. W 20.67" / D 24.18" / H 39" / 17.6 lb.